BonChon Chicken, the global crispy chicken phenomenon, introduces the BonChon Crispy Crepe, the newest addition to their delectable lineup of high quality fresh and fast food. Known for innovating classic favorites into even more delicious offerings, BonChon takes the classic crepe and serves up their own version: crunchy, flaky, and even more loveable. BonChon’s all-new gourmet version features crispy dough filled with delectable fruit preserves, and drizzled generously with luscious toppings. This shines as a sweet meal-ender or as a satisfying snack. The new BonChon Crispy Crepe is available in two variants —Apple Caramel and Mangoes and Cream. 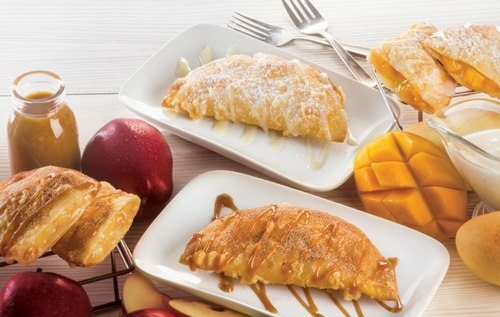 The Apple Caramel Crispy Crepe is generously filled with premium apple preserves and topped with homey cinnamon brown sugar and caramel sauce, while the Mangoes and Cream Crispy Crepe is made with finest mango preserves and topped with a delightful serving of powdered sugar and sweet milk cream. Get the new BonChon Crispy Crepe for only P60 at any BonChon store in Metro Manila and Bulacan. Or call and have this crunchy sweet treat delivered: Metro Manila 633-1818, Baliwag 044-761-1818. Marilao 044-8151818. Coming soon to Baguio, Cavite, Cebu, and Davao.